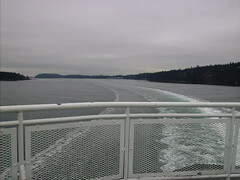 I live on an island (Vancouver Island, the furtherest west side of the province of British Columbia in Canada), and as such my commute involves getting on and off the island via ferry or plane. Last week I went from Victoria (where I live) over to Vancouver to do a graphic facilitation job with the BC Organizational Development Network. 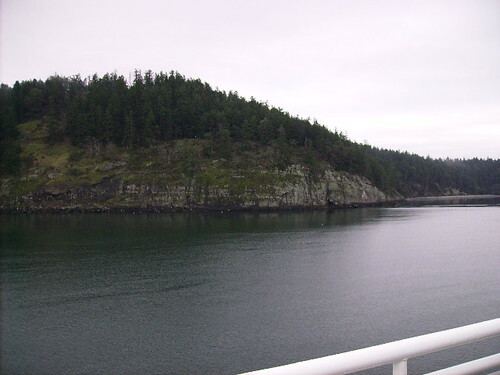 And I took the ferry (1.5 hours) – something I can do quite regularly depending on my schedule. It is easy to get complacent and forget just how beautiful this route is. As I have a new digital camera I was inspired to take a few shots and share the view with you. A little melancholy and misty this time of year, but beautiful nonetheless. 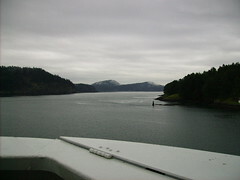 Passing through the San Juan Islands. 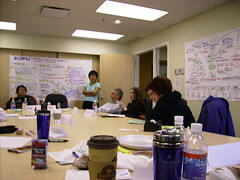 Once over to Vancouver, I spent the next day working with a sub-cohort of The BC Organizational Development Network – a loose network of organizational development specialists in the greater Vancouver area. We did an abbreviated Strategic Visioning Process: drawing out the network’s history, their current situation and plenty of visioning around their desired state over the years ahead. A fun and productive day with an output of a Version 1.0 draft of their new vision and discussion around next steps: process for involving more members in the vision and discussion around strategic steps for next year’s operational plan. 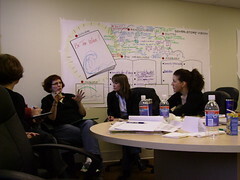 Was a fun day and I really appreciated this skilled group of fellow facilitators, consultants and planners being willing to turn their reins over to me – and being so open towards the graphic way of working. A really nice event.